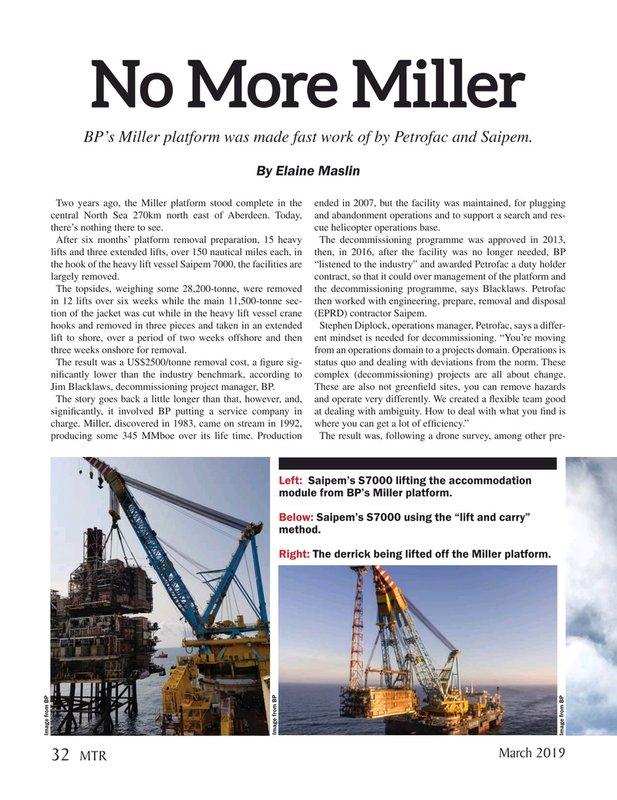 BP’s Miller platform was made fast work of by Petrofac and Saipem. Two years ago, the Miller platform stood complete in the ended in 2007, but the facility was maintained, for plugging central North Sea 270km north east of Aberdeen. Today, and abandonment operations and to support a search and res- there’s nothing there to see. cue helicopter operations base. The result was a US$2500/tonne removal cost, a ? gure sig- status quo and dealing with deviations from the norm. These ni? cantly lower than the industry benchmark, according to complex (decommissioning) projects are all about change. Left: Saipem’s S7000 lifting the accommodation module from BP’s Miller platform. Below: Saipem’s S7000 using the “lift and carry” method. Right: The derrick being lifted off the Miller platform.